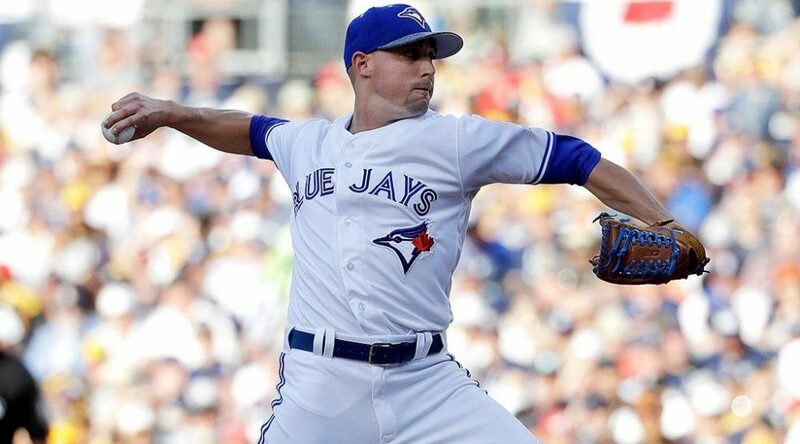 Aaron Sanchez, the stud right-handed starter for the Toronto Blue Jays, made his MLB all-star debut last night, travelling to his home state as a replacement for injured Red Sox closer Craig Kimbrel. You could have made the argument, and many did – including me, I swear – that Aaron shouldn’t have had to wait that long. Having put up 2.5 wins, according to fangraphs.com’s version of the Wins Above Replacement metric, the 2011 Northwest League champion – as a member of the world famous Vancouver Canadians – is easily one of the most productive 14 pitchers in the American League and should have been named to the original squad. By walking a hitter and a half less this year and striking out close to two more, Aaron has seemingly harnessed the stuff everyone knew he possessed. This has allowed him to be remarkably consistent thus far, averaging just over six and a half innings per start while only going less than five on one occasion. With 14 quality starts out of his 18, the right-hander is keeping some pretty heady company as he’s right up there with names like Madison Bumgarner and Clayton Kershaw. I would love to end the article right here, making a few predictions for Aaron’s second half, congratulate him, once again, on this all-star selection, crack a beer, done. But, alas, unfortunately, Sanchez’ situation doesn’t allow for a neat and tidy ending. As skipper John Gibbons confirmed during a recent radio hit, the plan is still to transition THEIR BEST STARTER back to the bullpen at some point. The Jays aren’t letting on as to what factors will make the decision but if I was to wager a guess, they won’t let him go 30% higher than his previous innings pitched high as a pro, which was 133. That would put the 24-year-old (happy belated to Aaron by the way, who shares his birthday with the great nation of Canada) at about 175 to 180 innings for the year, leaving him with around 60 to play with, 20 of which will probably be saved for his time in the bullpen. That leaves approximately six more starts or, depending on how the Jays brass manage their off-days, a mid to late August call to the pen. Search the internet and you’ll find plenty of opinions on the value of ‘protecting’ young starters’ arms by limiting their innings. I’d like to think the Jays have some proprietary knowledge they’re not sharing with us but I’m too much of a cynic. The science has so far proven nothing. What can’t be argued is the fact that Sanchez, despite his track record in the bullpen, won’t be able to provide the kind of value to the Jays that he currently is as a starter. As you can see, despite the video game stats being put up by these guys, only the otherworldly Betances is even close to Sanchez in terms of WAR. Their limited roles don’t allow for the effect that Sanchez could (and should) bring as a starter. Sanchez is moving to bullpen. No matter what the numbers say and no matter how long I hold my breath and close my eyes. There’s no doubt that Aaron will be a valuable addition to the back end of Toronto’s relief corps, but who is going to take his place in the rotation? Come September, in a close race, who do you want making that all-important start? Aaron Sanchez? Drew Hutchison? Trade target ‘x’? I know who I would take. Unfortunately my choice is going to be pitching an inning here and there in a role he should leave behind for good in 2017. Hopefully it’s not too late.